This project was created on 09/23/2016 and last updated 2 years ago. The TIL311 had a alphanumerical brother the TIL305. 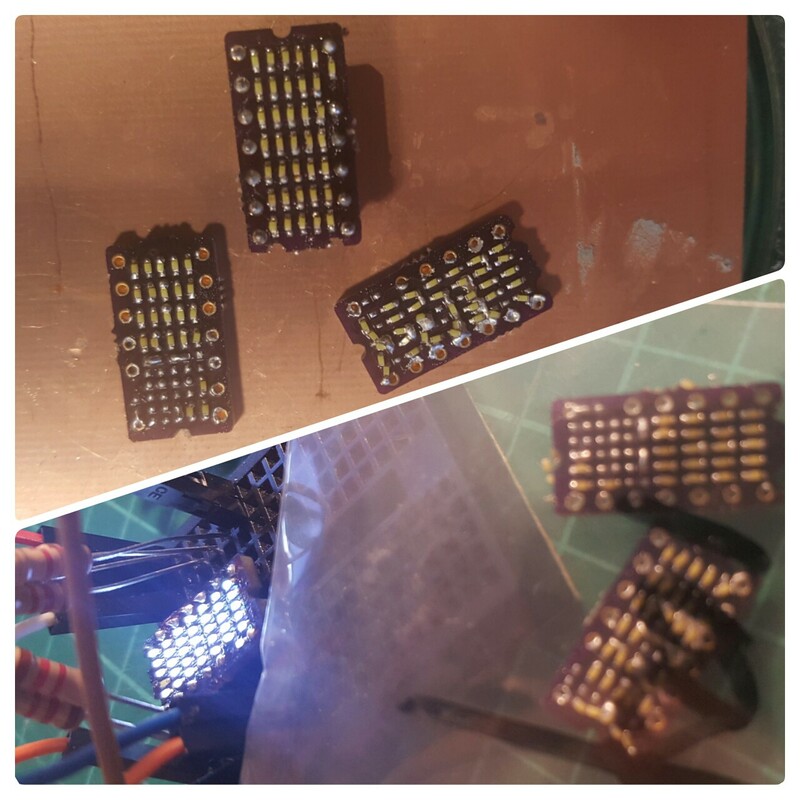 This was a 5x7 LED matrix in the same form factor. Similar to #PICTIL, which is replacement for TIL311 this can replace TIL305. This is more a fun project, or side project of #PICTIL. There are still original TIL305 available. And also other pin compatible parts (like LTP-305). But only with red or green LEDs. Also the character size will be bigger with reDOT. If you want to try building it and soldering some 0402 LEDs, you can get your own boards from OSH-Park: But order them on your own risk. The boards do not full fill OSH-Parks design rules. With 5mil traces and spaces they are a little bit smaller. But for me that is more a prove that they can handle also 5 mil, which fits much better in my normal grids. It is not doing much. Just count up though all ASCII chars. (and it is with 1095B already over 1kB). More features like brightness control or serial interface will be added. I hope I will be able to solder that. That&apos;s an impressive home soldering job! when ordering parts: consider that normal pinheaders do not fit (to thick pins), but 1,27mm pinheaders with pins removed do fit good. Did you try to built one? :( With some practice 0402 should work. But to be honest my first 0402 component soldering failed also. without a stencil for the solder paste it&apos;s just trial and error for me :) maybe later this night I&apos;ll be trying again, certainly this weekend. Fixed the one LED not shining so I have one working :) the other ones I&apos;ll might redo when I need em. Congratulation! As far I know you have now the 3rd working unit. And white is a nice color choice. now that you say that, I thought I&apos;ve bought warm white LEDs :D oh dear. I might add some 2K epoxy later to make sure it keeps working. and I&apos;ve just ordered green LTP-305 from pimoroni... nice work, I might order some. totally in for some blue ones - maybe in some red epoxy for a purple shine. You are about to report the project "reDOT", please tell us the reason.